Tom Herman was a perfect 6-0 against ranked teams at Houston but got his second such win in six chances here at Texas. Quarterback Sam Ehlinger played well and said this win should "instill confidence in us." The Longhorns fed off the full house at Royal-Memorial Stadium and had a complete performance in every phase. Texas won a big game Saturday night. 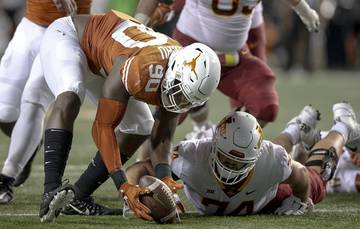 Nothing less, nothing more, but the Longhorns’ pulsating 37-14 victory over 22nd-ranked Southern Cal represents distinct progress for the home team. On every front. Especially for a team that hasn’t won all the little games. Better to be a work in progress than a team in regress. So save the confetti for the time being. Texas won’t expect a parade any time soon, not with a pedestrian 2-1 record and an onslaught of tough games in front of it. The Longhorns have more than a little work to do, but there’s no denying this was a sweet one. Before a raucous full house that included a governor, about 70 Longhorns recruits for classes as far away as 2022 and a record 103,507 fans, a football program that’s been mired in mediocrity put on a display of physicality and completeness and showed positive signs of a burnt orange turnaround that clearly will last forever and ever. Unless, that is, Texas gets beat by TCU and this was just one more momentary mirage. There was little doubt that Tom Herman needed this win in the worst way after a close win over Tulsa and a loss to Maryland, but his Longhorns got it in the best possible way. He’d gone a perfect 6-0 against ranked teams during his stay at Houston but was a disturbing 1-4 versus such before Saturday with a win against a West Virginia team that didn’t have its quarterback the second half. Is this the best he’s felt at Texas? This had all the earmarks of a cornerstone win, even over a Trojans team that forgot it was Tailback U and ran for a minus-5 yards and may have the most hideous special teams in creation. It was a comeback victory for a team that trailed 14-3 in a disastrous first quarter against a quarterback looking like the second coming of Carson Palmer. Texas looked good in every phase of the game with robust play on both sides of the ball and only a single turnover when a Trojan stripped Daniel Young of the ball. The strong showing in which the team scored the final 34 points of the game gives a tremendous confidence boost. This one felt different. It looked different. And unless God just absolutely hates the Longhorns, it will be different for a team and a head coach who’s sitting on a 9-7 career record here and coveting some positivity. Herman found it in a defense that suffocated the run and had a tremendous goal-line stand, a quarterback who found receivers open downfield and a reliable kicker who made all three of his field-goal attempts. And maybe a fan base that will have some belief. This one didn’t win a Rose Bowl or a national championship. It won’t even win Texas a spot in the Associated Press Top 25 poll. And it sure won’t win Texas a thank-you note from USC coach Clay Helton, who probably doesn’t consider Austin quite as hospitable as the upcoming ACL visitors for all the bad calls. But Herman’s had his own problems. He needed this. Desperately. This stirring victory could not have come at a better time. When you lose to a Maryland team that got killed by Temple on this same Saturday and barely squeak by Tulsa, you squander a lot of capital before you’ve built up any assets. But is it a signature win? It sure is from the outside, but Texas will only be as good as its next performance, which comes against an angry TCU team that has dominated this series of late. One minute you’re the toast of the town, the next you’re being roasted all over town. That’s how it goes in a blue-blood program like Texas where teams play against a standard and not just an opponent. But maybe Texas got over a psychological hump. Only Kris Boyd ventured into that territory where no one should go for a long time.